Are you making an effort to make your home as energy efficient as possible? Installing skylights is one great way to do it. When you have skylights in your home, you won’t have to worry about turning the lights on during the day. This will help cut down on the amount of energy that you use, and it will save you money in the process. 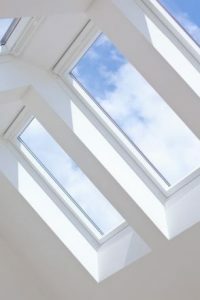 In some cases, skylights can also be used to trim your cooling costs since opening them can make a big difference in a warm home. Here are some of the other benefits that you will enjoy when you have skylights installed. Your home will get lots of natural light. There are a lot of people who wish that they could get more natural light in their homes. Nevertheless, this can be difficult in certain rooms. Skylights allow for more natural light to enter homes because of where they are positioned. They can also make rooms feel more open and airy once they are installed. Your home will be ventilated better. Many homes feel warm and stuffy during the spring and summer because they don’t get enough ventilation. Even when the windows are open, warm air ends up getting trapped inside of homes and making them uncomfortable. Skylights provide for better ventilation because they push warm air up and out of homes and allow for cooler, fresher air to replace it. You will notice an immediate difference when you have skylights installed in your home. Your home will be more private. There are certain rooms in your home, like bathrooms, where you want a lot of natural light but you don’t want large windows that allow for all of your neighbors to look into your home. Skylights make it easy to get as much natural light into rooms as possible without using regular windows. You can maintain your privacy in bathrooms, bedrooms, and other rooms without having to sacrifice light. Would you like to install skylights in your home, or do you have existing skylights that need to be repaired? Roofing by Bruce can assist you with all of your skylight needs. Call us at 570-424-8891 today for more information on the services we can provide for you.